It took me a while to accept that cooler temperatures are here to stay. I was in denial for the better part of October, but when my fingers started going numb on my runs it was time to face facts. The air is only going to get colder, and that means it's time to start layering my running outfit. 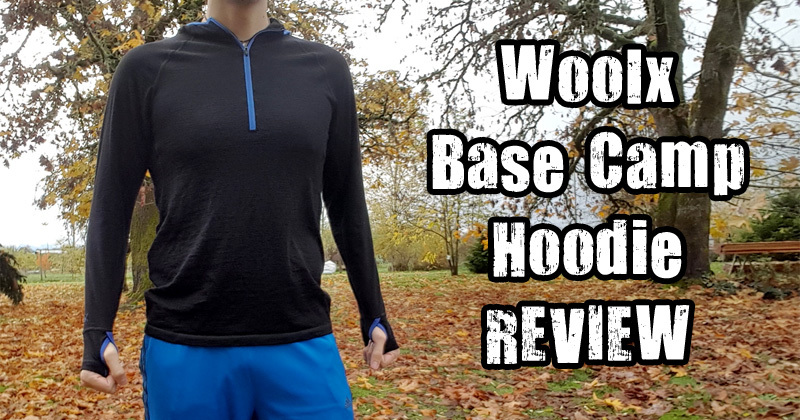 The good folks at Woolx helped me out this year by sending me one of their men's Base Camp Hoodies to review. Made from Merino wool, this lightweight hoodie pullover is intended to keep you cool and dry when temps start to drop. I've been running in it steadily over the past few weeks to put these claims to the test. The Base Camp Hoodie is made from 100% Australian Merino wool. Specifically, 17.5 micron Merino wool at a weight of 160g/m². This is both the finest weave and lightest weight that Woolx offers for their base layers, meaning that it is "soft as cashmere" and intended for either mild temperatures or for layering in cooler climates. Although it's a pullover, the hoodie features a half zip (11" zipper) on the front to help you adjust your level of comfort and exposure, or for style. 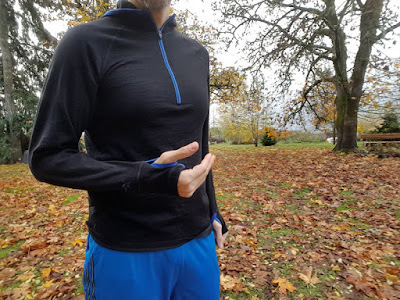 The long sleeves include thumbholes for a little extra hand coverage. My hoodie is black with blue trim, but it is also available in blue with black trim. I tried a medium size first, since I usually wear medium shirts. It turned out to be a little too tight in the shoulders for me. I then consulted the chest measurements on Woolx's sizing guide, which put me in a large. Their super-friendly customer service quickly facilitated an exchange and the large fit perfectly. In other words, trust their sizing guide. 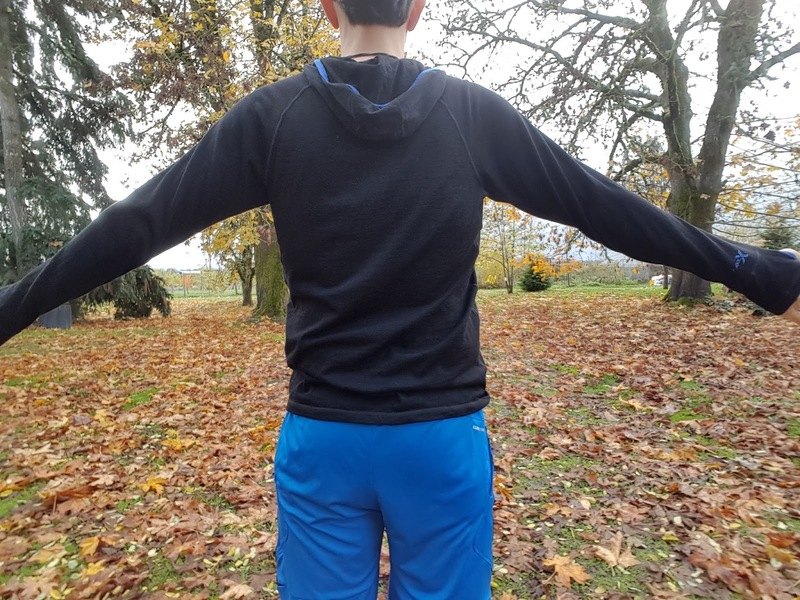 The hoodie fits snugly enough to feel secure without excess airflow, yet is loose and stretchy enough to feel comfortable when I twist around or swing my arms. The hood and thumbholes are also comfortable without feeling like the material is being stretched too much, even on my long frame. And while it's made of wool, Woolx claims you don't have to worry about this hoodie shrinking in a washer or dryer (turn it inside out and dry on low heat). I can verify that, as I've washed mine several times and it still fits the same. Hood up... and my Rocky impression. Don't I look tough? Now, if you hear wool and think, "isn't that itchy?" then you've probably never worn Merino wool before. Merinos are known for having some of the finest and softest wool of any sheep. It's not itchy at all, especially if woven as finely as this hoodie. On the contrary, it's incredibly soft and cozy. Even after a long run I never felt any irritation. While I've had a proud supply of Merino socks over the years, this was my first experience wearing it as a base layer. I've always worn synthetic base layers for cold athletic activity and I have to admit the all-natural Woolx hoodie puts them all to shame. There's something nice about having a natural fabric against your skin, as opposed to polyester. I wouldn't mind wearing it all day long. Here's what really matters. 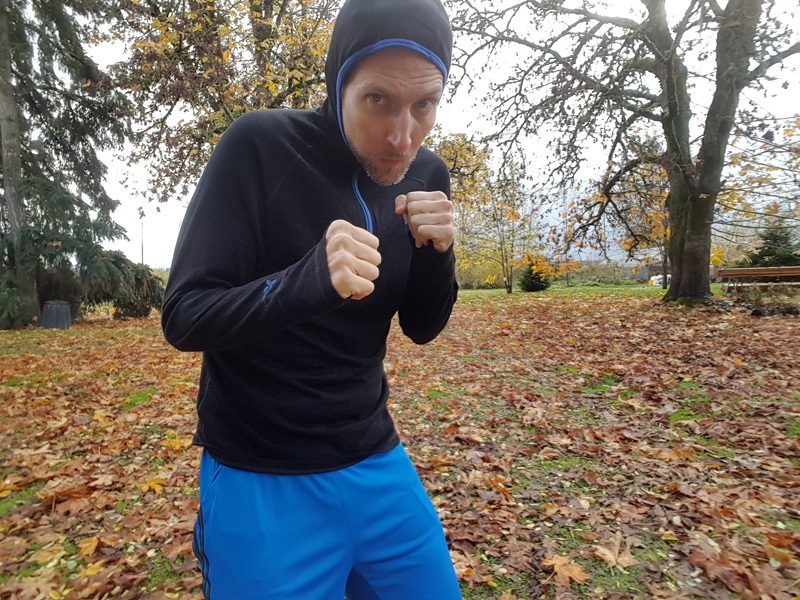 The hoodie may be a nice layer for camping or hiking, but how well does it keep me warm and dry on a sweaty run? I started wearing this layer as my only shirt in the last week of September, when temperatures here were hitting 60-ish Fahrenheit. 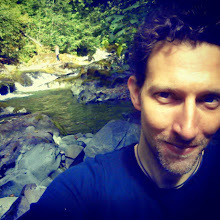 It felt good, and I was able to run over an hour without feeling any sweat pressed against me. It also made me realize that I could have worn this layer on warmer summer days without overheating. That's one of the really great features of Merino wool—it naturally wicks moisture away from the body to help you feel cool and dry in the summer, but warm and dry in the winter (for sciency folks out there, this happens because the keratin fibers are hydrophobic at one end and hydrophilic at the other). For the better part of October, I was fine wearing this hoodie as my only top. It quickly became my go-to favorite. As the month came to an end and temps dropped to the mid-40s, I found I needed a little more. If there wasn't much wind or rain, wearing the hoodie over another shirt was sometimes enough, though I prefer to have it against my skin (it is a base layer, after all). 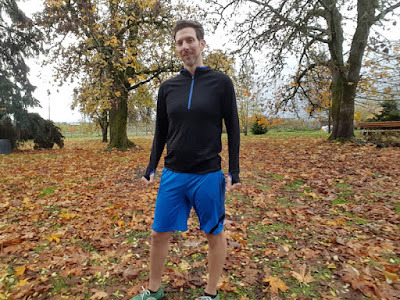 I found it preferable to just wear either a ventilated rain shell or a thicker running jacket over it, the former for moderately cold and/or rainy days and the latter for more intense chills. I suspect I'll end up wearing them all together as winter rolls in with our famous Oregon rainy season, which I've already done once this week. It worked very well; the extra layers kept me warm enough and my cozy Merino base kept me dry. It's worth noting that this Base Camp Hoodie is part of Woolx's lightweight collection. They also offer midweight (230g/m²) and heavyweight (400g/m²) base layer options for colder climates. 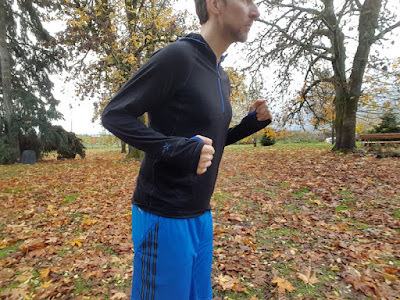 Since my western Oregon winters rarely dip below freezing I think I'll be happy running in this hoodie year-round. If I were to take a ski trip to our snowy mountains then I may want something heavier. 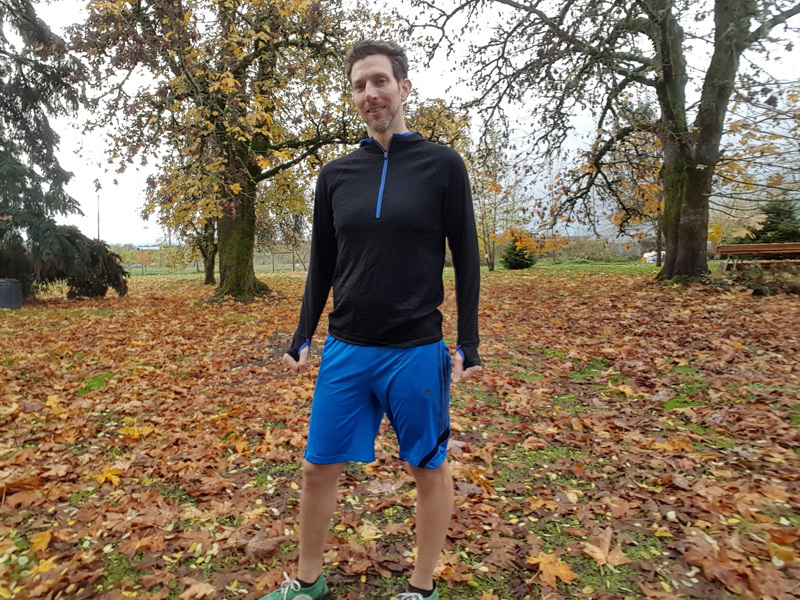 Even then, I usually prefer to add more layers that I can remove as needed rather than get stuck with a layer that's too warm and can leave me overheated—especially if I know I'm going to be active and working up a sweat. Whatever the case, my priority is that whatever lies against my skin must stay dry without irritation, and this hoodie certainly does the trick. I'm very happy with the Base Camp Hoodie. I even like the colors (heck, they compliment my blue/black running shorts). It's comfortable, warm and dry for mild climates and can be layered for anything cooler. I also love that it's all-natural, aside from the zipper. You'll be hard-pressed to find another base layer made of this quality. The only con I could find is that the hoodie is made in China. I prefer products made domestically, but I know this is rare and not practical for many companies. While it's a big perk to find American-made gear, it's not a dealbreaker for me. Some people may find the $95 price point a little steep, but for such a finely made Merino wool product I think it's worth every cent. Woolx definitely got my attention with this hoodie. I'm now looking forward to checking out their other Merino gear options. I was not paid for this review. All opinions are my own.